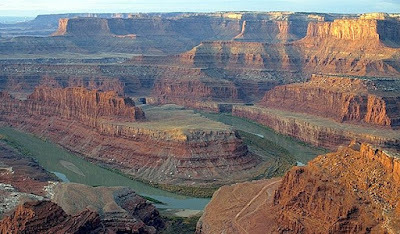 Dead Horse Point is another of the easy to access places that you ought to go to anyway, its a sight unparalleled anyplace on earth. The world cannot offer such spectacular sights any other place. The desolation and loneliness that must have reigned her in history are palpable. It is very easy to imagine yourself in this land stranded without a sip of water, far above the rivers flowing so inaccessible to one without easy access. Water was life for the settlers and pioneers. They travelled this dry land without enough at their peril. And many paid for it dearly. Another visible reminder is the nearby uranium tailings pond far below in one of the canyons. It is a sober reminder of the cost of the arms race, and a technology escalation that has cost us, and taken this region through bust and boom developments that continue trough this day. Worth informing yourself about while witnessing this grim havoc from the past.